According to an Acura dealer national meeting attendee's furtive report from the Aria hotel in Las Vegas, the new Acura NSX that'll reportedly be shown at next month's Detroit Auto Show will look extremely similar to Tony Stark's car in the upcoming Avengers movie. But wait, there's more. It'll also be, according to our tipster, a "hybrid" — yes, you read that correctly — and "will hit dealer showrooms in 24 months." Also, it'll be AWD. 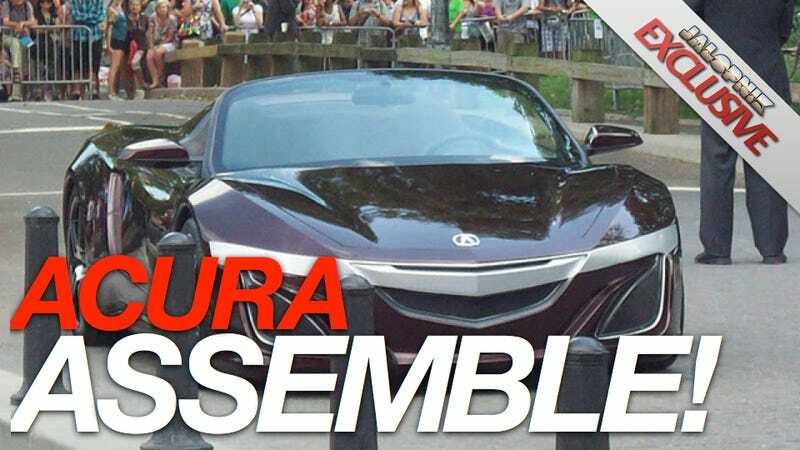 Now we want to see just how close it'll look to the Avengers car because, if you'll remember, Acura spokespeople told Autoblog that that car was nothing more than a one-off built for the movie. Likely true. But imagine that vehicle as a hard-top and we think that's likely what our tipster saw. All we know is we're getting more and more excited for the Avengers movie. Oh, yeah, and also the NSX — although we're not so sure how that "hybrid" thing is gonna work out. If any other national dealer meeting attendees want to chime in on this report, please email me — or comment below. And we'll even open up our pocketbooks — say, to the tune of $1000 — to the first person who gets us uncovered pictures from the meeting.